We need to look at the biggest possible picture. Having this kind of a vision means structuring board meetings differently. For example, instead of commissioning the Marketing Committee to work on a new graphic identity for the organization and come back with a report, the board might spend time at a meeting having a facilitated discussion on what concepts the organization thinks are most important to express visually. Instead of bemoaning shrinking audiences and wondering how to market harder, the board might invite someone from the local arts council, state arts advocacy organization, or university arts management program to discuss audience participation patterns and learn what other organizations and communities are doing to react to these trends. Instead of approving programs based on quantitative goals (how many people, how much money), the board might spend time development qualitative goals related to the organization’s mission (new audiences served, new art produced). The difference between governance and management is sometimes described as “the board creates policy, the staff carries it out.” The problem with this simplistic definition is that in not-for-profits, especially small ones with few paid staff, board members may well be acting both as governors and as volunteer managers. The chair of the Marketing Committee might well be someone who is volunteering time to create graphic designs and monitor social media. The chair of the Fundraising committee may actually be planning and executing the Holiday Gala. 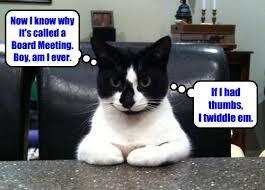 This often means the lines between governance and management get a bit blurry when it comes to the board meetings. At the board meetings, the board should be doing the work of governance (see previous: “big picture”). I often hear that the goal of the board should be to grow from a “working board” where members are involved in day-to-day operations, into a “policy-making board” which is exclusively concerned with governance. This is a faulty thinking process. The board should always govern. What happens in the board room should always involve governance issues. When a board member is acting as a volunteer staff member, she or he reports to the CEO and many (if not most) of the issues that they would otherwise bring to the board can be dispensed with in the CEO’s report. In other words – the board should not be deciding which folding chairs to order. For those in the back, let me repeat that: the board should not be deciding in a board meeting what kind of folding chairs to order. That is management business. I have written before about my frustration with boards that recruit me and then don’t use my skills. This never fails to astound me. Not that I am the only person in the world that knows anything about anything, but I do know a little bit about arts management, having written two books on the subject (here and here), taught it for nearly twenty years and spoken on various arts management issues to audiences around the world. I suspect, however, that many of the people who have sat in board rooms with me do not know these things. This, I have come to understand, is not because they are trying to disrespect me, but more simply because board meetings are not set up to be hospitable to the kind of work that I do. Like other board members, I sit in board meetings and vote on how many postcards to order, grit my teeth when the same people ask the same questions about how the budget is organized, and listen to various committee chairs try and recruit volunteers for the events they are in charge of. I often hear board members get excited about recruiting “business people” to arts boards. Often this means just getting anyone in the corporate world to join the board, regardless of their experience or skills. Someone who works as a teller in a bank will not be able to help with finances, and you can’t assume that a small business owner is automatically a good marketer. A real estate lawyer won’t be much help with contracts. And all of these people may well be totally out of their element when it comes to not-for-profit arts practice. So instead of thinking of potential board members as representing a particular demographic group or profession, or people who could volunteer a particular skill, boards should recruit based on (you guessed it) the big picture. Who has the passion for the organization, love for the arts, knowledge of what’s needed, and problem-solving skills to get us where we need to go? As an employer once told me, I don’t need to hire someone who knows how to write a press release. I can teach people how to write a press release. I need to hire someone who knows what a press release can do and how it fits in to the organization’s plans. I need to hire someone who understands how to convince others that our organization is worth supporting. I’ve got more to say about all this, so I guess there will be a Part 3 next week. Let me know your thoughts. This is another huge issue and I agree that it’s very prevalent in churches. Much of what I have written here about reimagining tasks and meetings applies to volunteer management as well. In my experience, boards plan a bunch of stuff assuming they will be able to get volunteers to help but the potential volunteers never had a chance to weigh in on the activities. It’s more like, “Hey folks, we’re going to have a big church picnic! Yay fun – but now we need x people to set up, x people to bring food, x people to clean up…” Like arts organizations, people don’t go to church to be cajoled into doing busy work, they come to church to be inspired. First, the board needs to do more resource planning. How many activities do we have planned, how many volunteers do these activities need, how many members do we have? Do the math. Then, rather than planning in a vacuum, what about going to the membership and saying, we have a choice between these three activities but we think we can only support two of them. Which would you rather volunteer for? Ellen, would you be willing to come and present this to my board sometime? I’m loving these blogs and loved the HBR article you referenced in your previous post.